ZERONA... the first non-invasive body contouring procedure to effectively remove excess fat. Unlike invasive weight loss surgery, ZERONA™ is applied externally. Our chiropractic office in Warner Robins, Georgia provides this revolutionary method to create results while at the same time allowing patients to remain active during treatment. 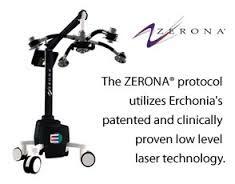 The ZERONA protocol utilizes the Lipo Laser, the safest and most researched low level laser in the world. Voluminous adipose tissue can appear when fatty material is present, and this, in turn, can bring about enlarged subcutaneous fat regions. Because subcutaneous fat is close to the skin's surface, laser emulsification can have a dramatic effect. The collapse of adipose arrangements have been noted after laser therapy, reducing their volume and providing effective body contouring results. ZERONA™ is a modern body-sculpting procedure designed to remove fat and contour the body without invasive surgery. ZERONA™ unlike other procedures allows the patient to continue their daily activities without interruptions from surgery, pain or wounds. ZERONA™ works by utitilizing the Erchonia LipoLASER (FDA market cleared for laser assisted liposuction) to emulsify adipose tissue which then releases into the interstitial space. The excess fat is passed through the body during its normal course of detoxification. The ZERONA™ procedure was proven through a double blind, randomized, multi-site, and placebo controlled study in which patients averaged a loss of 3.5 inches, and some lost up to as much as 9 inches compared to the placebo group that lost only a half an inch. During the procedure patients most often do not feel anything, the laser that is being administered is a low level laser that does not produce heat, it is completely non-invasive, and has never shown any recorded side effects. Low Level Lasers have been in use for over 40 years for treatment of many different conditions such as chronic pain, wound healing, and many other orthopedic conditions. Treatment takes 40 minutes and needs to be administered three times a week for a minimum of two-three weeks for best results. The laser will be applied over the targeted areas i.e....waist, hips and thighs for 20 minutes and then the patient will turn over and do the same treatment on the opposite side. This should be a minimum, for maximum results consult your physician about doing more than one two week session. After completion of the two week protocol clinical trials resulted in an average of 3.5 inches lost; and some patient's losing up to as much as 9 inches. As with any procedure results will vary and may be more dramatic from one patient to the next. This is not a quick weight loss program-we are targeting the adipose tissue and are not taking off excess water weight. We are removing the excess fat to successfully shape the body for a more desirable outcome. Think of the last time your waist was 2-3 inches thinner. With the ZERONA™ treatment you now have an alternative to a shapelier figure without having to endure the fear, and sometimes painful process of a surgical procedure. For a noninvasive, alternative medical solution to the traditional fat-removal procedures and surgeries, consider use of the ZERONA® laser procedure. For more information: contact our office at (478) 918-0102 or click [email protected] to set up a consultation to meet with the doctor, and be sure to return to us as we continue to make many more advances in the field in the coming months and years. More information is also available during our in-office consultation.